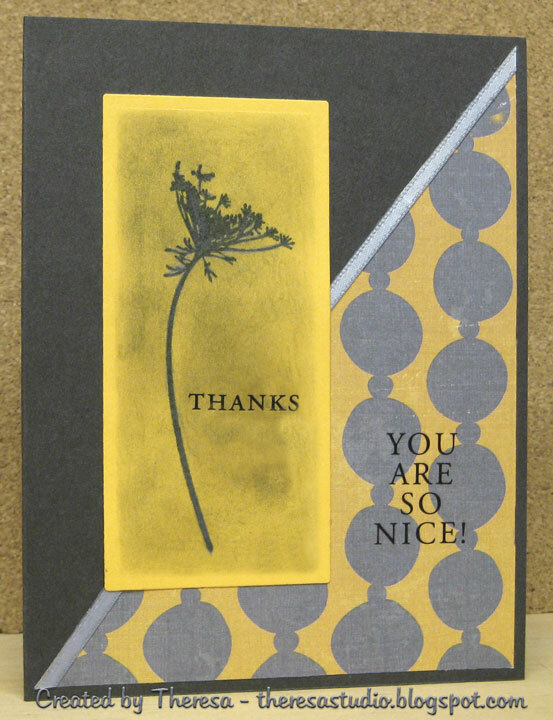 Say it in grey and yellow is Annabelle's Color challenge and the sketch challenge is from Gina K at Stamp TV. Combined the 2 challenges into this card. Stamped the flower with grey ink and used grey pencil also. Sponged the mat while still in the nesties with grey. Finished with rub on sentiments. Rub ons: Karen Foster "Thanks"
The cardstock looks darker in photo but is a slate grey color. Not that sure I like this card ...but it looks better in real life...kind of a contempo look which is more clean and graphic than I usually do. You do clean and graphic very well... love it! Very nice card. Im loving the image. Thank you so much for playing along over at annabelle stamps blog! It's beautiful what you've done with your image, it gives a great effect!